A beautiful accent Pendant Necklace by Frederic Duclos. Done in White Sterling Silver, four laser cut squares descend from a bar drop. Light, easy to wear and with visual movement. Rhodium plated to prevent tarnishing. Pendant is 1 1/2" L X 3/4" W on a 16" to 18" adjustable chain. 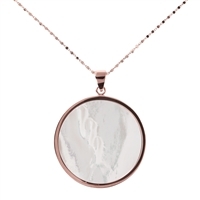 A round, white, Mother of Pearl Pendant Necklace that is perfect for any occasion. Dress it up or down, layer it with other Necklaces. Made in Italy by Bronzallure, it is finished in their 18k Golden Rose' patented plating. Pendant is 1" in diameter. Chain is 18" to 16" adjustable. Lobster clasp A light, easy to wear anywhere Pendant Necklace by Frederic Duclos. Done in White rhodium plated 925 Sterling Silver, a cluster of interlocking rings create this diamond shape. A mix of polished & laser cut rings create visual interest. Pendant is 1 1/2 L X 34" W. Chain is 16" to 18" adjustable. 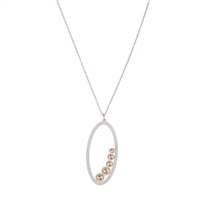 A lovely Oval drop Pendant Necklace in 925 Sterling Silver with a contemporary feel. The solid double drops in the center have a brushed Silver finish, contrasting with the polished Oval rings surrounding them. Made in Italy by Frederic Duclos. Length 16" to 18" adjustable. Pendant is 1 3/4" L X 3/4" W. Rhodium plated. 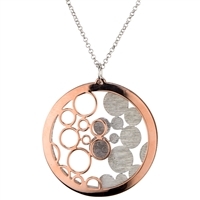 Contrasting White & Rose Gold plated Sterling Silver Circle Pendant by Frederic Duclos. A single Rose Gold ring is surrounded by larger White Sterling rings that have been laser cut for visual interest & a little sparkle. Pendant is 1 1/4" on a chain 16" to 18" adjustable. Rhodium plated. 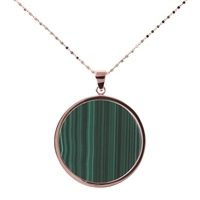 Designed with style & simplicity in mind, this long, round, Green Malachite Gemstone Pendant is the perfect accent piece. Wear it alone, layer it with other Necklaces, or double it and wear it as a lariat. It has a beautiful open link chain 34" in length. Made in Italy by Bronzallure. Finished in their patented 18k Golden Rose plating. Pendant is 1 3/4" in Diameter. The clean lines of simplicity, with a touch of color. This Sterling Silver Pear Shaped Pendant is made in 925 Sterling Silver with the 2nd drop plated in Rose Gold. By Frederic Duclos. Made in Italy with a Rhodium finish to prevent tarnishing. Chain 19" to 18" adjustable. Pendant 2 1/8" Make a statement with this stunning Borealis Pendant Necklace by Frederic Duclos. A large Oval Drop has been plated with a Brushed Yellow Gold finish, then wrapped with laser cut White Sterling Wire. The finishing touch is two small Light Blue Topaz Gemstone set as an accent. 925 Sterling Silver. Pendant Length 2 1/4". Chain 16" to 18" Adjustable, White Rhodium finish. 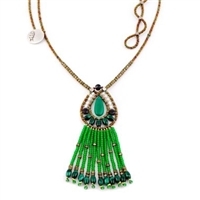 From Ziio's new Fenice Collection, this brilliant Green Tassel Pendant Necklace is a contemporary update on a popular style. The Green Malachite & Zircon Gemstones compliment each other & are accented by Black Spinel & White Water Pearls. On a Murano Glass & Zircon "Cord" 28" to 32" in adjustable length. Pendant is 3 3/4" L X 1 1/4" W. Hand crafted in Italy on Stainless Steel wire. 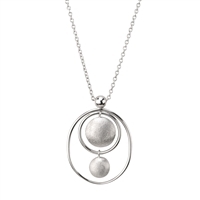 A lovely circular drop Pendant Necklace in 925 brushed Sterling Silver with a whimsical feel. Accented with a Grey Druzy, this Moon Pendant is sure to get many compliments. Made in Italy by Frederic Duclos. Length 16" to 18" adjustable. Pendant is 1 1/4". Rhodium plated. Matching Earrings available. This two-tone open work Circular Pendant Necklace by Frederic Duclos is perfect to brighten up any outfit. Done in White & Yellow Gold plated 925 Sterling Silver with their signature laser cuts for reflective qualities. On a double two-tone chain this Pendant sparkles like shooting stars. . Made in Italy. Pendant 1 1/8". Chain 20" to 22" adjustable. Matching Earrings available. Double Drop Pendant Necklace with depth & dimension. 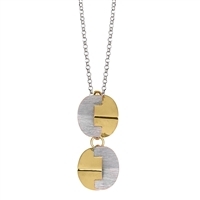 The geometric pieces fit together like a puzzle and are done in a Brushed Silver & Yellow Gold Plated. Made in 925 Sterling Silver by Frederic Duclos. Pendant Length 1 1/2 inch. Chain 16" to 18" adjustable. Matching Earrings available. Large diamond shaped Pendant Necklace in white 925 Sterling Silver by Anna Beck. The ornately framed gemstone at the center is Turquoise with a Mother of Pearl overlay - giving it a beautiful opalescence effect. Made in Bali by skilled craftsman. On a 30" long Chain. Perfect worn alone or for layering with your other favorite pieces. Pendant, L 1 3/4" X W 1" Tiny seed beads of Smokey Quartz Gemstones fill the Gold filled hand wraped chain and hold a triangular Pendant of Petrified Coral. Made in the U.S. by Elisa Ilana. Adjustable in length from 16" to 18". Coral Pendant length 1 3/4" This modern, dimensional large Circular Pendant will add a little fun to any outfit. Done in two-tone Sterling Silver, White & Rose Gold plated, the back has brushed Sterling Bubbles, while the front has open, floating Bubbles. There is also a smaller Bubble (1/2") on the chain. 925 Sterling, Rhodium plated. By Frederic Duclos. Pendant 1 5/8". Chain 20" to 22" adjustable. An edgy 925 Sterling Silver Necklace with a bold look, yet light in weight. 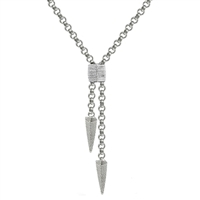 This Lariat Necklace has a chunky look to the chain that is complimented by the laser cut silver wrapped Pendant Bead and Pyramid Drops. Designed by Frederic Duclos, made in Italy. Rhodium plated. Length 17" to 18" adjustable. Pendant Drop 4" long. Large oval shaped Pendant Necklace with a Black Onyx Gemstone at the center. Made in 925 White Sterling Silver with an ornate designed frame for the gemstone. 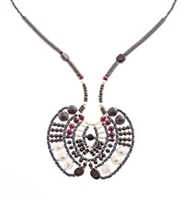 Handcrafted in Bali by skilled artisans, each silver bead is hand placed onto the base. On a 30" long Chain. Wear alone or perfect for layering with other Necklaces. By Anna Beck. Pendant, L 2" X W 1 1/8" It is time to shine with Frederic Duclos's Druzy Gemstone Pendant Necklace. 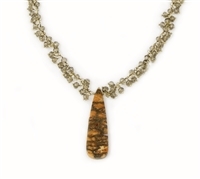 The Pendant features 3 Druzy drops in alternating Gold & Grey, descending in size. It has a double chain - one in Silver & one in Yellow Gold plated. Made in 925 Sterling Silver. Pendant L 2" X W 5/8". Chain 16" to 18" adjustable. A stunning Statement Art-to-Wear Necklace by Ziio. Hand crafted in Italy, the Fluorite Gemstone center Pendant is surrounded by a row of small Black Onyx Beads accented with Amethyst Gemstones. The asymmetrical Neckline features Turquoise & White Water Pearls with Pink Opal as the accent piece. Sure to garner you attention & compliments! Sterling Silver & Murano Glass Beads crafted on Stainless Steel wire. Center Drop is 4 1/2"L X 3 1/4"W. Length is adjustable 18" to 15". Sterling Silver Button Closure.